News and opinions on the best league in the world. Sevilla have announced their first signing of the summer, St. Etienne fullback Mouhamadou Dabo. The French right-back will join Sevilla on a free-transfer on July 1st, when his current contract expires. 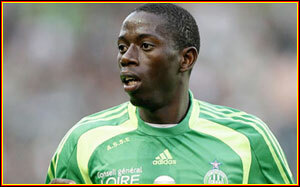 Senegalese born Dabo, 23, had been capped at youth level for his country of birth, but made himself available for France following his move to St. Etienne in 2004. To date, he has earnt 17 caps for the French U21 side. His excellent performances for club and country led to his first senior call-up in 2009 for France’s game against Argentina, however he is yet to make his international debut. The powerful defender who can also cover at left-back will join compatriots Julien Escudé, Sébastien Squillaci, and Abdoulay Konko at the Ramón Sánchez Pizjuán, where he will be reunited with ex-St. Etienne team-mate, Didier Zokora. Subject to a medical on Monday, Dabo will sign a four-year contract with a release clause of €25m (£21.7m).